My first dinosaur. A rubber Stegosaurus from my own personal collection. 1) A gateway into palaeontology? As I mentioned above this was the first dinosaur toy I ever owned and was bought from a newsagent in Herne Bay in Kent close to where I lived. Every week if I was a good boy, I’d get a dinosaur model which formed the basis of my now embarrassingly large collection. It’s tempting to put on the rose-tinted specs to say that this specific toy was what inspired me to study palaeontology and work with natural history collections but toys and books were my first exposure to the world of long extinct animals. A well worn trope amongst palaeontologists when explaining why they went into palaeontology is to say that we never grew out of the ‘dinosaur phase’ most of us have as children. It also says something that most paleontologists I know decorate their offices with dinosaur toys , models and posters and can often be found in museum gift shops adding to the collection. Considering that this much loved toy is over 30 years old it’s in remarkably good condition (maybe I was also curatorially minded as a young child) apart from the slit down the cheek on the right hand side, created during a rather traumatic marble removing incident. 2) Accurate representation? 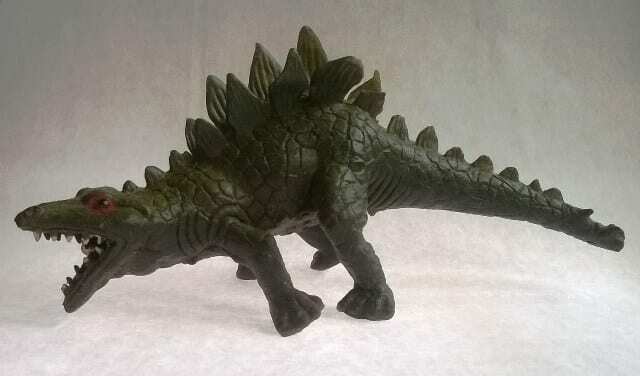 Although I’ve identified this as a toy of a Stegosaurus, the row of plates along the back is a giveaway, it’s not an especially accurate reconstruction. The limbs are sprawled out like a modern reptile not tucked under the body. Either for ease of manufacture or laziness the double row of plates along the back turn into single rows above the head and along the tail. The proportions of the body are out quite a bit and the head and neck are much too large. There’s a wildly incorrect series of sharp pointed teeth in the mouth instead of a beak and although we might attribute it to artistic flourish it’s unlikely that stegosaurs would have possessed evil red eyes (rather poorly painted on at that). So although we can identify this as a Stegosaurus it’s more something that was once inspired by the idea of somebody describing an image of a Stegosaurus perhaps. I’m not alone in quizzing the anatomical accuracy of dinosaur toys, I recommend the excellent Dinosaur Toy Blog which scrutinises old and new toy lines in terms of their accuracy. 3) Maker’s Mark.So how did this particular toy get made? Unfortunately, the only maker’s mark on the toy is ‘Hong Kong’ on the underside of the belly. I’ve not been able to find out much more about this presumably cheap line of toys online either. However, this kind of shoddy model isn’t just a blast from the past. Chances are you can pick up your own poor dinosaur representation the next time you’re at a natural history museum, zoo or aquarium like the below equally awful snake-necked Stegosaurus I bought at the Natural History Museum London last year. When this 30-something year old model was produced it would have been inaccurate according to the scientific literature at the time but it’s the enduring popularity of the idea of dinosaurs that means that toys like this were mass produced cheaply for sale worldwide even as far as Kentish seaside newsagents. It’s also because of toys like this that many people grow up with, that outdated representations harking back to 19th Century interpretations of dinosaurs as perpetually angry, unfeathered, tail dragging, lizard-gaited monsters persist as toys and across popular culture. It’s also why the Jurassic World was widely scorned by the palaeontological community from the trailer alone because of the list of inaccuracies that could be spotted in that short clip alone will continue to perpetuate wrong ideas for yet another generation. A more recent example of a less than perfect Stegosaurus toy bought in the Natural History Museum shop quite literally rubbernecking. 4) Rubbish Rubber Representations? Before we write-off rubbish representations like this, this toy does represent how powerful representations can be in conveying ideas. 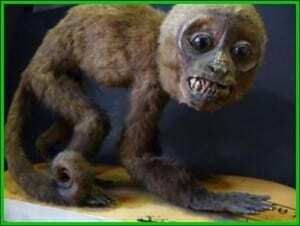 When it comes to long extinct animals, nobody ever saw what they looked like yet most of us can conjure up images in our minds of what mammoths, dinosaurs, pterosaurs ‘looked like’ and this is exclusively from our exposure to representations in a variety of media. Toys, film, paintings, comics and literature bring these creatures to life and sometimes the representation is so powerful that old ideas can be difficult to shift even if we know they don’t have a solid footing in fossil evidence. It’s no coincidence that announcements of new species of dinosaur or even unveilings of museum specimens, like the Natural History Museum’s Stegosaurus skeleton ‘Sophie’, are always accompanied by official artwork. As ideas and concepts change and are updated it’s representations like our rubber Stegosaurus here that serve as a history of interpretation and popularity in wider society. You can see this toy as well as a range of toys and models of dinosaurs through the years in our exhibition Strange Creatures: The art of unknown animals which runs from 16th March to 27th June 2015. The Grant Museum of Zoology is open from 1–5pm Monday to Saturday (but closes for a few days around Easter). Admission is free and there is no need to book.